In 1759 Prochor Moshnin, who became one of Russia's most beloved monks and was canonized by the Moscow Patriarchate on July 19, 1903 as Seraphim of Sarov, was born in Kursk, Russia. At the age of eighteen Prochor made a pilgrimage to Kiev Caves Monastery. 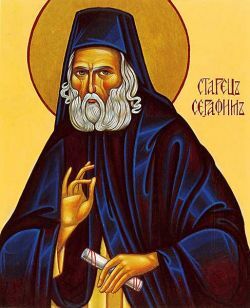 The starets Dositeus sent him to the hermitage of Sarov, and there Prochor began to live the monastic life with such conviction that on the day of his profession he received the name Seraphim, "the ardent one." In his desire to live in greater humility according to the Gospel, he asked for and obtained permission in 1794 to live alone in the forest near the monastery. There he cultivated his desire for communion with God in prayer and by listening to Scripture. Until 1810 he lived in total silence and seclusion, except for several brief interruptions. Upon receiving an order to return to the monastery, Seraphim spent the next five years as a recluse in his small cell at Sarov. Finally, he opened the door and began to offer spiritual counsel, the fruit of thirty-seven years of solitude and prayer dedicated to what he saw as the goal of Christian life, the acquisition of the Holy Spirit. By this time, having found deep peace in the closeness to God he had reached at the cost of so many sacrifices, Seraphim was radiant and paschal, a starets capable of guiding many people in the spiritual life. He founded a community for women at a short distance from Sarov, and during the last years of his life he continued to pray and to offer his fatherly care to everyone who came to ask him for a word. He died on January 1, 1833, and is also commemorated in the Anglican calendar. and find peace of heart.